The creation and proliferation of trusts was one of the hallmarks of the Gilded Age. By eliminating competition, consolidating power and controlling their respective industries, trusts such as Standard Oil, US Steel, American Tobacco and the American Sugar Refining Company gave rise to many of the colossal fortunes which helped fuel the era and add a little more “gild” to it. While the Titans of Industry who ran these trusts were powerful men, that didn’t mean that the ladies didn’t want in on the action. Or so the Chicago Tribune claimed when it ran this somewhat tongue in cheek article in January, 1898. 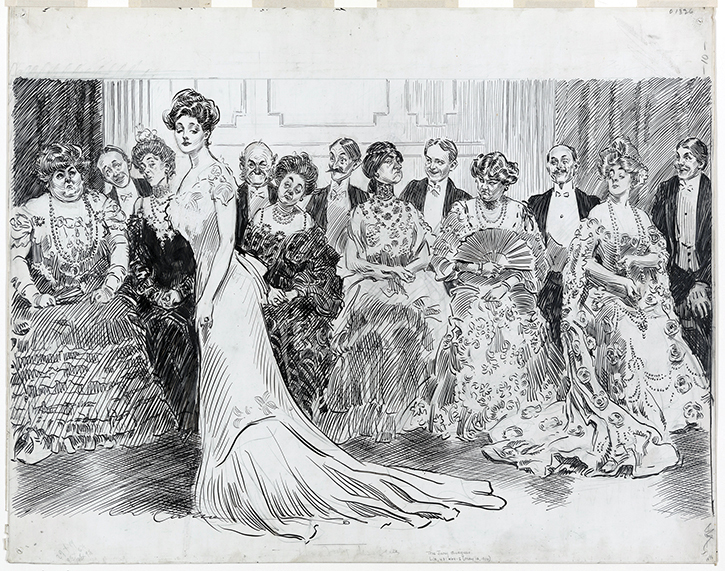 In retrospect, we know this was really about Mrs. Ogden Mills machinations to succeed Mrs Astor as Queen of Society. Part of her strategy was to re-exclusive it, shutting its doors a bit to eliminate some of the newer moneyed people that had infiltrated Caroline Astor’s 400 and the Patriarchs Balls, which had previously marked inclusion into the inner sanctum. Ruth knew she couldn’t do it alone however. She formed an uneasy alliance with nine other handpicked women. Among them were a few “friends” of impeccable lineage, a few potential rivals, and a few “up and comers” from the younger generation. Being a part this ultra exclusive inner circle did not mean all ten women were equals. The trust was controlled by the “Big Three” Queen Bees Caroline Astor, Ruth Mills and Mrs. Henry T (Jessie) Sloane, with the other seven serving as “ladies in waiting”, as it were. While most of the names on the list probably come as no surprise, a few are not so well-recognized today. Here they are. The Trust didn’t last long, and soon dissolved (unsurprisingly power sharing is never easy, and seldom harmonious). Here is a brief look at what happened to each of the women. 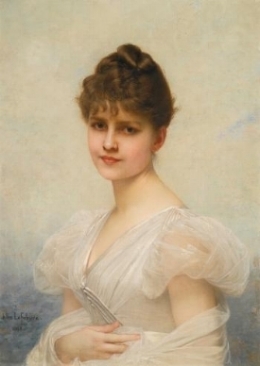 Ruth considered herself to be Caroline Astor’s natural successor. As cunning and intelligent as she was, she was not considered warm or flexible able enough (for even Mrs. Astor made exceptions to her own rules when needed). Society had grown too large to be effectively corralled into a smaller number. While invitations to her exclusive events were highly prized, they did not serve to define who was in anymore. She never admitted defeat in her quest, continuing her excruciatingly correct entertaining and stately seasonal migrations between homes in New York, Newport, the Hudson Valley and France, until her death in Paris in 1920. In 1898 Caroline Astor was the undisputed reigning Queen of Society. She had recently resumed giving her annual ball after several years’ hiatus, after moving uptown to a French limestone chateau in 1896. At 68, her age was beginning to show however. There would be no dethroning her, but soon enough her power would wane. 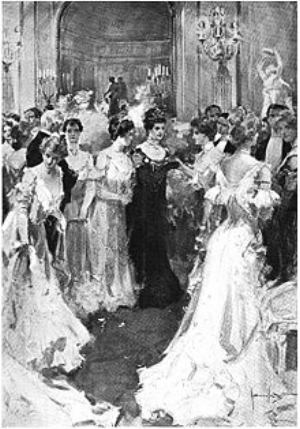 She hosted her last ball for The 400 in 1905. It was said in her last year before her death, as dementia set in, she would stand in her empty ballroom greeting imaginary guests at her ball. Queen ‘til the end. Mrs. Henry T Sloane (née Jessie Robbins 1858) The vivacious and popular Jessie Sloane was a few years younger Ruth Mills and her biggest potential rival to Caroline’s throne. Possessing the charm Ruth lacked, Ruth’s decision to acknowledge her as an equal, was more than likely to potentially neutralize her. A year later however, Jessie caused a scandal which knocked her out of contention, when she obtained a divorce from her husband Henry Sloane. Hopping on a train to Greenwich Connecticut, where she married Perry Belmont later that same day. While divorce was becoming increasingly common in Society no one could imagine a divorcée leading it, and certainly not one who took on a new husband less then six hours after divorce, no matter how prominent he was. The Belmonts decamped for a Europe to let the scandal blow over. One can imagine Ruth’s relief when she heard the news. After their return two years later, they made the more socially liberal Washington DC, their home base, commissioning Horace Trumbauer to design an obscenely lavish mansion for them to entertain in. Jessie Robbins Belmont died in 1935 in Newport, where the Belmonts had their summer cottage “By The Sea”. Nipping at the heels of the Big Three was Mrs. Stuyvesant Fish, better known as Mamie. She and Ruth were like oil and water. While a terrible snob, Mamie liked to have fun. She found Ruth’s rigidity boring, while Ruth thought Mamie’s themed parties (where guests dressed as servants) and jokes (she once had a dinner in Newport with a monkey as the guest of honor) debased society. The article diplomatically acknowledged the two had some recent misunderstandings, and hinted that she might be leaving the “trust” soon. It is perhaps fitting that Mamie, known as a bit of a maverick and always up for a fight, would be the “trust buster” of the group. Mrs Orme Wilson (née Caroline Astor, 1861). Her inclusion on the list was almost certainly by virtue of her being Mrs. Astor’s daughter. Carrie lived in a beautiful home just around corner from her mother, entertained graciously, and was well liked. Noncompetitive by nature, she became one of the next generation’s social leaders, but had no desire or ambition to be its queen, as her mother had. At 23, not only was Gertrude the youngest member of the group, she had the distinction of being sister in-law to two of its other younger members. Intelligent, strong, and with the Whitney and Vanderbilt millions backing, she had the funds and the constitution necessary to lead the next generation. As she matured however, her interests turned more towards the arts than controlling society. Her legacies include the Whitney Museum of Art and enduring tabloid fodder from her custody battle over niece Gloria Vanderbilt. Of all the women in the group, Mrs. Hewitt is probably one of the least recognized today. The daughter of banker and stockbroker Frank Work, she and her younger sister Frances (who married Englishman James Burke-Roche and was the great-grandmother of Princess Diana) were considered great beauties of the Four Hundred. She married inventor Peter Cooper Hewitt in 1887. After their 1918 divorce she remained socially active, but lived a much quieter life than in her earlier years. Mrs. Almeric Paget (née Pauline Whitney, 1874) Pauline was the good friend and sister in-law of Gertrude Vanderbilt Whitney (married to her brother Harry Payne Whitney). Pauline’s 1895 marriage to British aristocrat Almeric Paget had been considered one of the social events of the year, only barely eclipsed by the marriage of Consuelo Vanderbilt to the Duke of Marlborough a few weeks before. 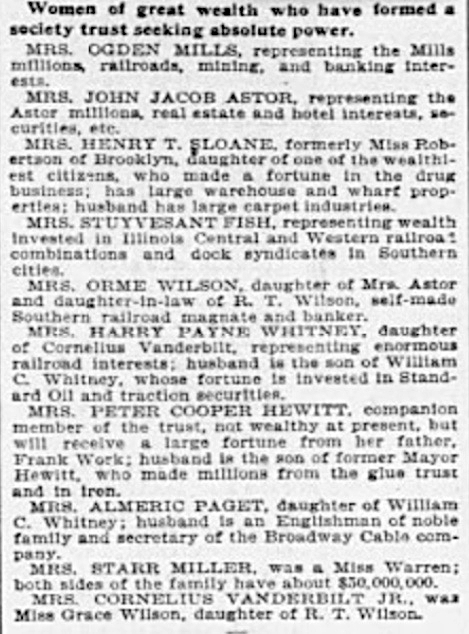 It was generally expected that she would follow in the footsteps of her late mother (the beloved Flora Payne Whitney, who had died five years earlier) as one of New Yorks leading hostesses. In less than ten years, Pauline’s poor health would necessitate the Pagets spending most of their time abroad however. Pauline passed away in England at age 51 in 1916. Edith was born into a family with impeccable social credentials. Her father George Warren was a founder of New York’s Metropolitan Opera, and her brother was the architect Whitney Warren. Married to industrialist William Starr Miller in 1866, the couple owned beautiful homes in New York, Newport and the Hudson Valley. If she had ambitions of leading society, they never gained traction. By the next decade she seemed to have settled into the comfortable middle of the social scrum. It was a respectable spot, but not a leading one. Edith’s daughter and only child, also named Edith, would go on to marry Almeric Paget the widower of fellow trust member Pauline Paget in 1923. While Grace was one of the younger members of the trust, she was already undoubtedly one of its most ambitious. Her marriage to fellow trust member Gertrude Whitney’s brother Cornelius against his parent’s wishes had gotten him effectively disinherited. That didn’t stop Grace from relentlessly pursuing the crown with grit, tenacity and an appreciation for the rising power of the press and good PR over the next several decades. By the 1920s and 1930s she had become the Queen of Society, at least at least in the eyes of the masses. After spending millions in pursuit of her throne, finances finally forced her to vacate the Vanderbilt brownstone palace In 1944. She turned around bought fellow trust member Edith Starr Miller’s former home at 1048 Fifth Avenue, jokingly calling the 28 room Trumbauer-designed mansion her “gardeners cottage”. She kept it until her death in 1953.